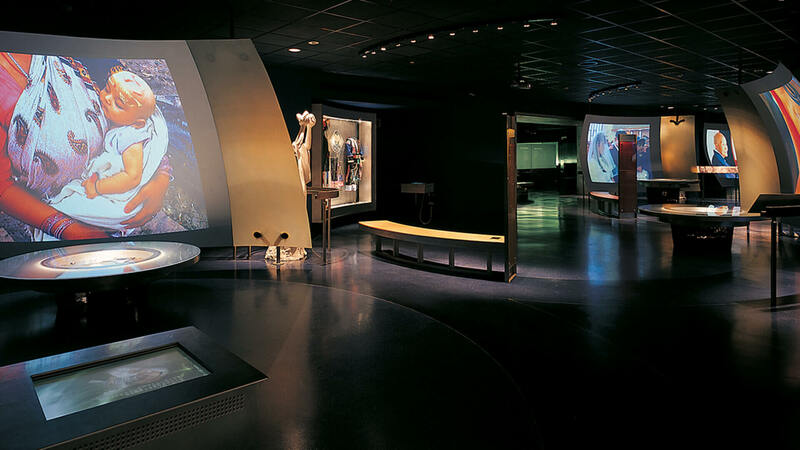 Since the opening of the Museum of World Religions (MWR) in 2001, all visitors have been saying they walk away much impressed by the two topical themes that fulfill the museum’s space and mission: the effort for the education on life and the pursuit of interfaith respect and dialogue. 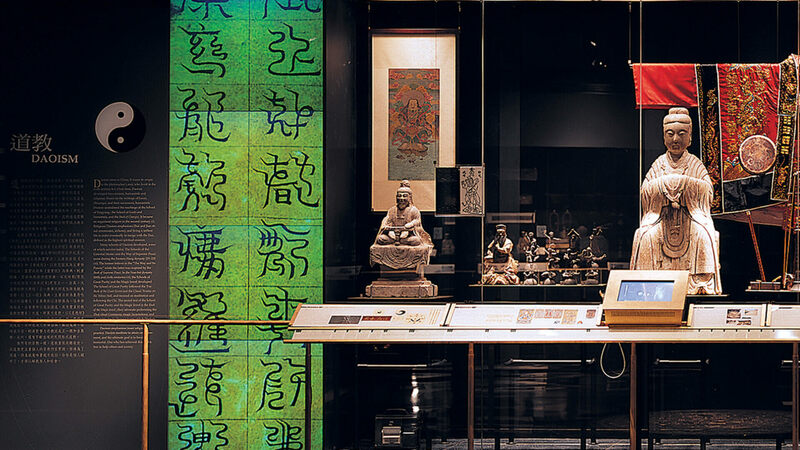 It is easy to understand why the two issues ‘exploration of life’ and ‘quest for peace’ have been central to the founder of the museum, Master Hsin Tao, for his lifelong dedication. To propagate these ideas, the Ling Jiou Mountain (LJM) Buddhist Society has been abiding by one axiom in managing each and every promotional campaign: ‘we inherit Dharmas for dissemination to benefit all sentient beings’. In our journey of exploration in pursuit of simplicity in life, as well as through the liberation of sentient beings by virtue of the Waterland Dharma Ritual, we gain the understanding of life’s reality and truth. And judging from the establishment of the Museum of World Religions and the preparations for the planned University for Life & Peace, you will perhaps realize that the LJM has been accomplishing daunting tasks one by one, step by step, with all our efforts and endeavors aimed at the ultimate objective of overcoming invasive adversities challenging all sentient beings by virtue of the unconditional selflessness of the Dharma and by the power of compassion to finally achieve safety and security for all lives and lasting peace for the world. Of all the rites and rituals the LJM is reputable for, the Waterland Dharma Ritual is the most important. And as far as Master Hsin Tao is concerned, the two single most meaningful projects are the Museum of World Religions and the planned University for Life & Peace. And life and peace are obviously the common denominators here. The meaning of life and its value can be judged differently by the individuals, but it is important to note that ‘life’ refers to a lot more than just the humankind, but all life forms and beings, including that of our planet. Therefore and from the standpoint of purifying Dharmas, Master Hsin Tao as a visionary with compassion has been calling out for all earthlings to build a spiritual world, and in the process heal the ecological wounds inflicted upon the Earth the way the humandkind entrusts the meditative practice with the curing of body, mind, and soul by the self-healing mechanism people are believed to be capable of. Buddhism is a religion that goes much further than healing to merely save the heart and soul of people, but helps through a spiritual quiet to elevate the state of our mind that cares about a clean surrounding and a protected environment. Let us forget not that the Dharma of Chan is always in tune with, as well as in the company of, Nature. However, the appeal for interreligious peace, for respect of life, for the care of our planet can gain no traction by chanting slogans only. Instead, education is the way to go for seeds of good to be sowed to take deep rooting. We, therefore, have established the LJM Sramanera School at Naung Mon in Myanmar, so that children as novice monks benefit from an education system that enables them to grow up in a symbiosis with Nature where respect is taken for granted. Let us ignore the generation gaps and collectively build a Land of Bliss on Earth. The LJM network TV (093TV-http://tv.093.org.tw/en)) has produced the ‘Education on Life’ series that takes the viewers on a journey of exploration of the topical theme of life and education. The series will address three major topics, i.e. the LJM Waterland Dharma Ritual, the planned University for Life & Peace, and the LJM Sramanera school at Naung Mon. It will prove to be an engaging topic for the viewers to understand why the LJM Waterland Dharma Ritual, since its initial staging in 1994, has become an ever-increasingly popular Buddhist event the general public enthusiastically support annually for 24 years running. Furthermore, the LJM Waterland Dharma Ritual has been invited to go overseas for the spirit of the Liberation en mass to benefit more countries. What elements of good qualify a Waterland Dharma Ritual as good and effective? What can we learn from the liberation that sentient beings are granted from such a ritual that allows us an insight of the true meaning of life? Moreover, our series aims at revealing how the planned University for Life & Peace and the Sramanera School reach set goals or will accomplish given objectives, by implementing the unique system of ‘Education on Life’. Enjoy our series of in-depth reporting that documents true stories on-site and we look forward to welcoming our dear viewers to join us in good karma and pledge commitment to our common and shared cause here. Thank you. ‘When the heart is at peace, the world is at peace’ is a popular quote by Master Hsin Tao that has become near-synonymous with the venerable Chan Master himself, and serves as one of the major guidelines for the Ling Jiou Mountain (LJM) Buddhist Society. Religions usually always came about in response to the psychological need of people for the sought-after support. For all faiths around the world, be it Catholicism, Protestanism, Muslim, Buddhism, etc., with the corresponding deities such as the Heavenly Father, God, Alah, the Buddha, etc., people pray to who- and whatever that would hold them in infinite awe. Add to that the circumstantial differences from geographical, historical, socio-political, to cultural aspects, and it is easy to understand why religions ought not to be ex- but in-clusive for peoples and countries practicing different faiths to co-exist in harmony, peace, and mutual respect, so much so that religions stay true to one universal commonality, and that is the pursuit of truth, good and beauty. ‘Love the Earth / Love Peace’ is therefore quite obviously the mission for the LJM Buddhist Society. And, on that note, ‘Compassion and Chan’ are not just nouns for mere slogans, but they are verbs instead that manifest themselves as the only method for deliverables in fulfilling our mission. The quiet and peaceful tranquility acquirable for the heart through meditative Chan practice enables cross-links of peaceful hearts for interreligious and interpersonal tactics, and that between faiths and people as well, to spread compassion and love around in contacting one another, bonding with one another, understanding one another, helping one another, communicating with one another, until we realize it is true that ‘when the heart is at peace, the world is at peace as well’. 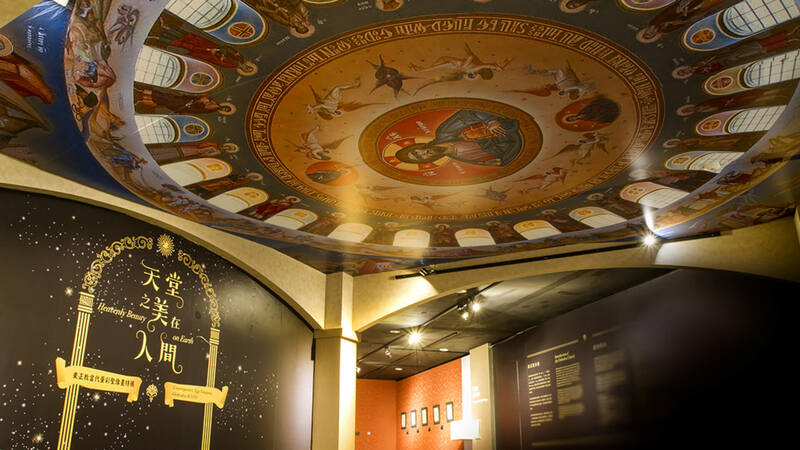 Such realization is much greater and more meaningful than any scientific invention, and the conviction was instrumental for the birth of the Museum of World Religions (MWR). 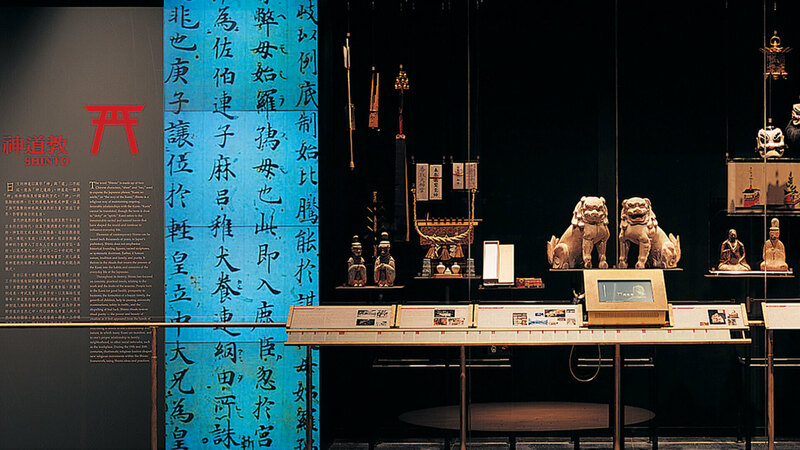 Master Hsin Tao of LJM unveiled the Museum of World Religions in the YongHo District of the New Taipei City in 2001, which was and still is Taiwan’s first and only professionally curated museum focused on religions of the world and on the education on life. Over the past ten-plus years, the MWR has mounted theme exhibitions featuring religious art and artifacts and conducted educational seminars and forums that highlight characteristics and traditions of different faiths, in order that visitors learn to respect (other) faiths, embrace different communities and sub-cultures, as well as to love all sentient beings. In sum, so that our community and society move forward in harmony and peace. Hans Kuhn, who is responsible for drafting the ‘Declaration towards a Global Ethic’, said that ‘there is no world peace as long as the interreligious peace is absent.’ Having just reminded ourselves about that, we look forward to continuing our efforts in promoting as well as preserving precious religious culture. We expect to reach out further with our Education on Life to enrich food for thought for the general public. And accordingly, we hope to manifest the spirit of respect, inclusion, and love as the means for fulfilling our mission of ‘Loving the Earth / Loving Peace’, and our calling in promoting our belief in a diversified symbiosis and an interdependent co-existence for the whole Earth as One Family. 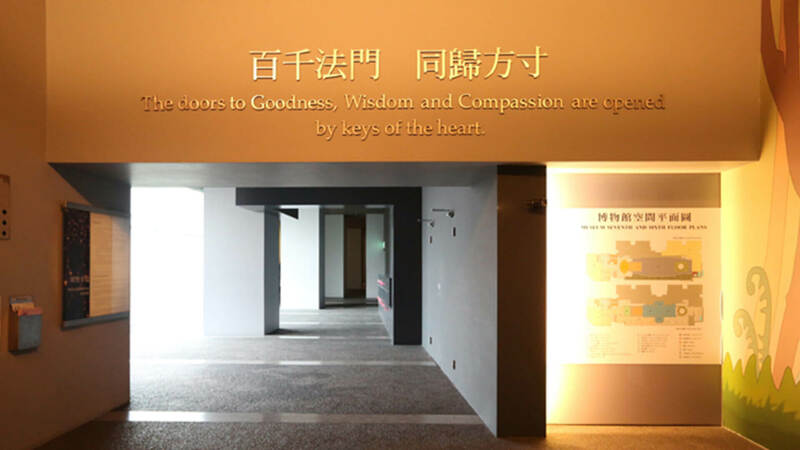 “Hundreds and thousands of Dharma doors (open to teachings of the Buddha, but they) all return into one (heart) ”, said Venerable Dharma Master Hsin Tao, citing a famous quote by the 4th generation patriarch of the Chan School of Buddhism. ‘One is All / All is One’ thus sets the tone for the Avatamsaka Realm as part of the permanent exhibition at the Museum of World Religions, while serving as a key reminder Master Hsin Tao sends our way. The mission and objective of the Museum of World Religions is to embody Chan via its journeys of life, and further still, to manifest in full the Avatamsaka Realm. Put succinctly, Chan in silence is the key to the heart, where all the flowers of truth (i.e. the Buddha’s teachings) are blooming everywhere -- hence the name Avatamsaka that translates ‘Flower Garland’. And from flowers comes the fruit, often a metaphor for ‘the cause and effect’ of the karma. To illustrate ‘One is All’, it suffices to review the metaphor we just shared: Chan - heart - flowers - truth - Buddha’s teachings - flowers - Avatamsaka - fruit - Chan. 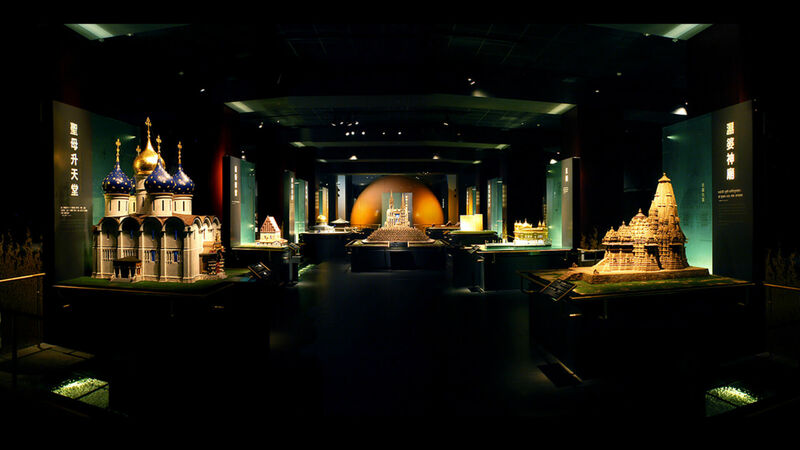 The Museum of World Religions has hardly ever found self-satsifaction, were its work limited to the conservation, exhibition, and storage of religious art and artifacts. Instead, it cares more about having all of its activities infused with some elements of the education of spirituality, on life, and for peace, so as to connect realities of our life to the truth, good, and beauty behind all spiritual faiths. At times thought-provoking angles are provided to help illuminate possibilities of transforming violent conflicts to peaceful harmony, and lead us away from ego-centrism and move towards a broad spectrum of the harmony of a diversified life community. ‘All Dharma are borne of the heart’, and ‘All Dharma reveal themselves only to the heart, and they all transcend because of the mind (awareness)' are revelations from the Avatamsaka Sutra. From the cosmic view of the Avatamsaka, everything is wisdom, seeds, being equal, and the revelation of wisdom is interconnected and there are no boundaries of countries, religions, or races, because we all belong to the same life community. People show differences because of the effect of their karma, which stems from different habits and patterns of life, which in turn give rise to different thoughts and ideas. In other words, there are no different lives per se and the variations and discrepancies only reside in habits that have no bearing on the essence of life itself. Therefore, all sentient beings are equal. So we avail ourselves of compassion and Chan, and by virtue of mercy, kindness, and compassion we connect individuals, families, communities, societies, countries and even the whole world. The scenario is described in the Avatamsaka Sutra in the famous quote that ‘the lofty Sumeru Mount can contain minute mustard seeds, and a small mustard seed can contain volumes as big as the Sumeru Mount’. Or, ‘small to the extreme until it contains nothing within, and big to the extreme until no limits can contain it without’. In other words, it can expand and shrink infinitely. One may then ask whether the infinite universe is there, and the surprising answer lies in the infinity but not the universe. Nothing escapes the cycle of 'formation / existence / decay / disappearance’ and the universe as we know it makes no exception. But the cosmic vision of Avatamsaka allows a plethora of universe whose formation and disappearance feed into one another, hence the concept of infinity and impermanence. The Buddha’s teachings, the Dharma, would want peace and joy for all sentient beings and that sufferings stay the furtherst away from all sentient beings, and that these do not part with peace and joy, and would want no differentiation for all sentient beings for these to exist in equality and happiness, and that comparisons and differences be kept away from sentient beings, so that difference-triggered confrontations and the ensuing blows and harms stay far away as well. Let us get the Chan and our daily life in sync, and with every breath we in- and exhale, and whether we move or hold still, we exemplify the axiom of ‘One is All / All is One’ that jumpstarts life and cognition. Thus accordingly, our life becomes one with the Avatamsaka Realm. 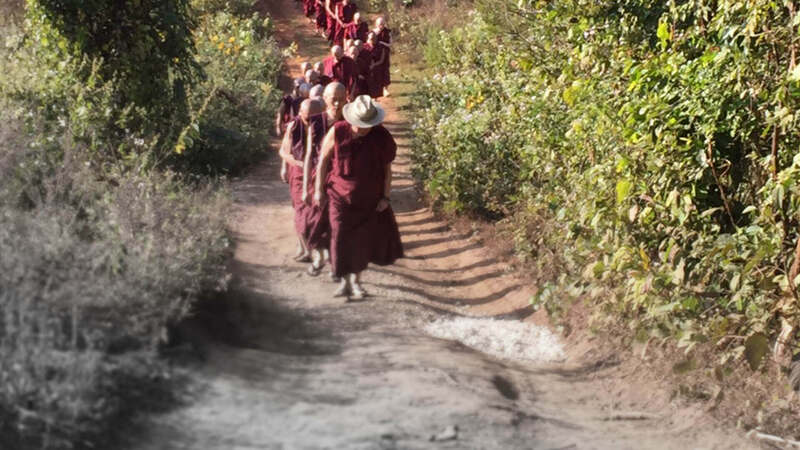 Thus accordingly and in 2016, the Ling Jiou Mountain (LJM) School of Sramanera at Naung Mon near Lashio in Myanmar on the premises of the DaShanYuan Monastery was officially launched. The adjacent lot is reserved for the planned University for Life and Peace, which has been seeing concrete progress of late. 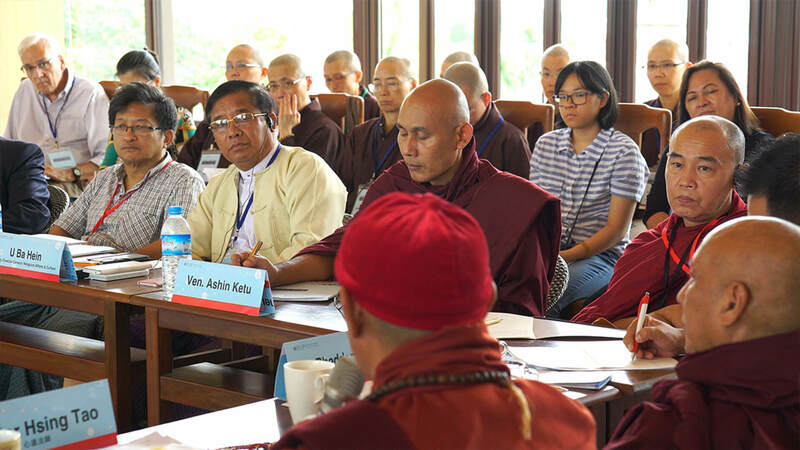 The School for novice monks will, among its many tasks and objectives, help cultivate talents for advanced studies at the planned University. And to create the University as a gift dedicated to Myanmar (the Master’s birthplace), to the humankind, and to the whole world is more than a wish on the part of the Master, but it is also the physical manifestation of LJM’s vow of peace. 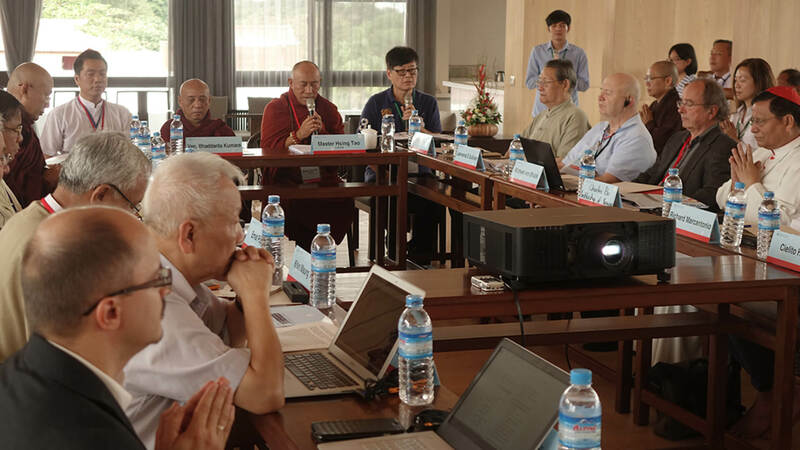 The design of the syllabus and curriculum for the School of Sramanera was inclusive of standard official Burmese syllabus of education, in order that the novice monks can also learn subjects besides Buddhism. Referred to as the NaungMon Project, early stage programs were such that they incorporated efforts to transform local economies, to implement Dharma education, as well as to inject medical and medicinal resources. On the other hand and for hardware, not only was the concept of Green Building introduced, but there are plans to pass on mission-critical skills of the environmentally friendly and ecologically sensible construction engineering, so that the local construction teams learn and spread how to build green and ecologically sustainable. Both in concept and in reality, the University for Life & Peace and the Museum of World Religions are two mutually aug- and complementary entities towards the ultimate ideal of ‘Love & Peace’. The underlining significance is that they both amplify as their common goals of education that humanity in effect is not limited to the humankind but for all sentient beings and that spirituality can be awakened via meditative practice. 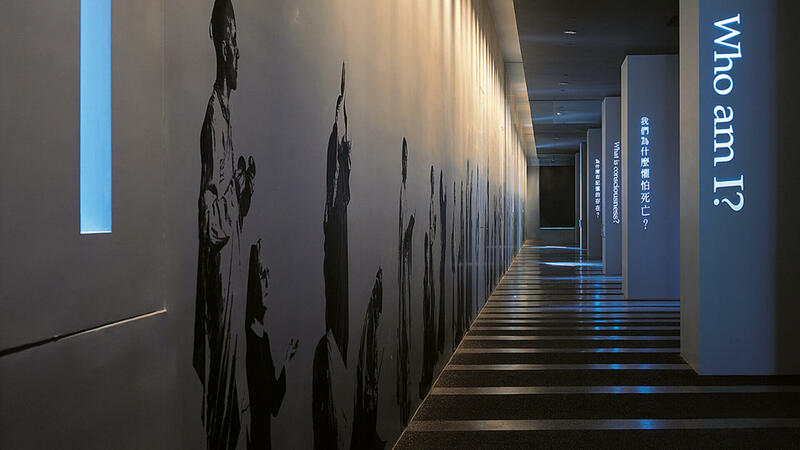 The Museum educates just as the University can be a catalyst for interfaith exchange and dialogue. By virtue of these two entities that are both pre-programmed with our signature ‘Education on Life’ embedded in their overall structure and design, the LJM Buddhist Society is Taiwan-based with a global vision and is highly hopeful of a manifestation that gives physical embodiment to our globally recognized ethic of ‘Respect. Inclusion. Love’. Thus accordingly, it can be said that the creation of the planned University for Life & Peace to spread and revitalize the Dharma is to ultimately reenact the spirit of India’s first-ever university at Nalanda more than 7 centuries ago, while at the same time its signature ‘Education on Life’ establishes a model that furbishes a concept of sustainability for the humankind, all other sentient beings, and the Earth. And the future university is poised to intensify interflow with other religions to promote communications. Put differently, the university’s flagship asset of ‘Education on Life’ will aptly illustrate the educational process that begins with a spiritual monologue, over a proactive listening to the heartbeat of the Earth, to reach a full circle of co-existence with all sentient beings in harmony. 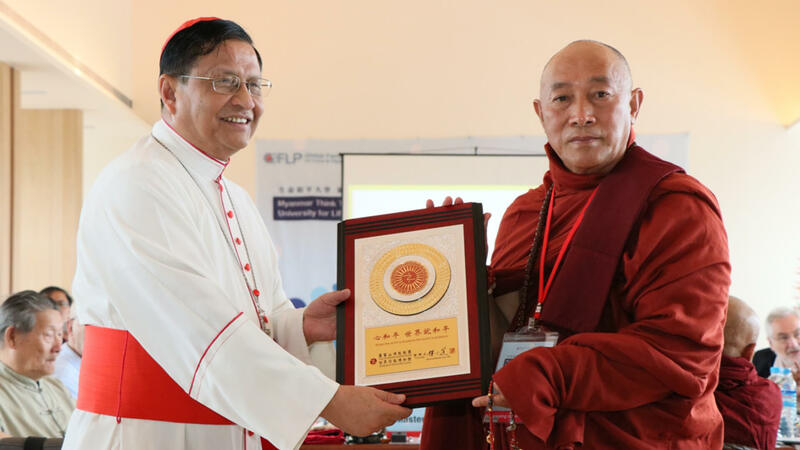 Therefore, Master Hsin Tao has been spending time overseas to promote the planned University for Life & Peace as different from the average religious universities and their standard teaching and learning system. The Dharma will be the future university’s interface to make known its all-encompassing care and love for all sentient beings. Already it has won over popular support of many internationally significant individuals and institutions of different faiths. Support to help Ling Jiou Mountain Buddhist Society(LJM) gain further tractions for the said visionary concept full of compassion. The LJM Buddhist Society designated a site for the Naung Mon campus of the ‘University for Life & Peace’ in Lashio, Myanmar, and as time wears on, people can get some glimpse of the progress on site and see that construction of buildings complies with environmentally friendly regulations for green structures from design concept to brick-&-mortar building. Volunteers from different parts of the world have gathered to make collective effort and a goodwill vow to strive for such a wonderful undertaking. 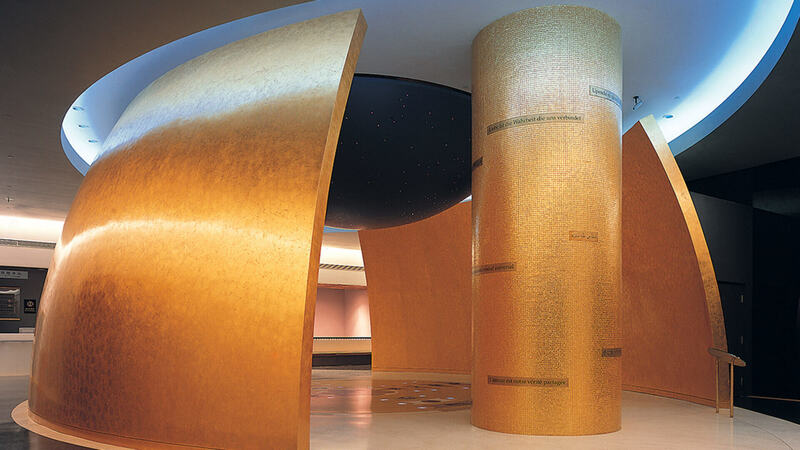 In a figure of speech, the Museum of World Religions can be viewed as a successful interface for mutual understanding and interflow among different religions, then the University for Life & Peace is a platform entrusted with the vision and mission to cultivate multifaceted world-class talents who are religious first and foremost. These two major initiatives are mutually aug- and complementary, and will make efforts both individually and collectively towards achieving Master Hsin Tao’s ideal of ‘Love and Peace’. Put differently, the purpose of the planned university is three-fold: by virtue of the inheritance of ‘Education on Life’ and its deep-rooting from the on-set, the university will demonstrate firstly that spirituality can be awakened by religious practice, and secondly, that humanity includes caring about all sentient beings, and thirdly, that the Earth needs healing of tranquility and harmony. It is further hoped that future generations will think equally highly of all sentient beings and reach every corner of the Earth with love to finally achieve the vision of a world in peace and an Earth thriving in a diversified symbiosis. In the special report on the University for Life & Peace, we have lined up chronological records of the Phase 1 physical construction of the campus, and on-site recording that documents the hands-on as was, and all in a happy land basked in the bright beams of the Dharma that eloquently speaks of the purity and innocence of a Buddhist country that is Myanmar. We trust that the viewers will visibly sense the sincerity and enthusiasm of this educational project that permeates throughout the production. The University for Life & Peace in the making bases itself essentially on the “Love the Earth” ideal of Ven. Chan Master Hsin Tao. Professor Michael von Brück of Germany has been entrusted with the overall responsibilities of the Project Planning Office for the future University. The German city Regensburg saw the first think-tank meeting in May, 2017, with participation by internationally-acclaimed experts from Europe. 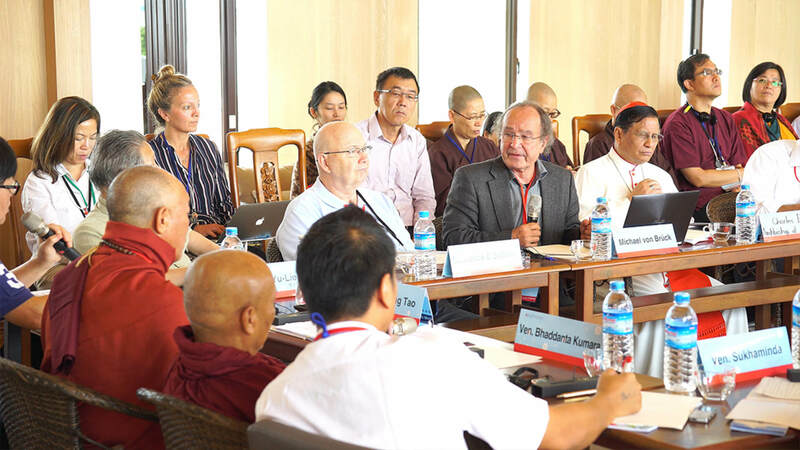 Professor Michael von Brück took charge of organizing the Regensburg meeting and compiled resolutions for expanded discussions at the consequent and second think-tank meeting in Myanmar, September 27-29. 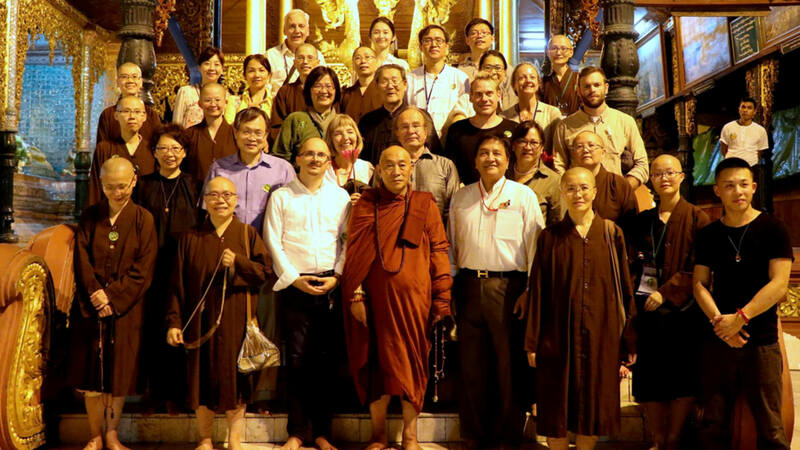 Venerable Bhaddanta Kumara, Chancellor of the National Buddhist Buriram University, Myanmar; Chan Master Sukhaminda, Abbot of the Loi Tain Kham Temple, Shan State, Myanmar; Venerable Professor Ashin Ketu, Aung-Da-Gon Pariyatti Education Center, Yangon, Myanmar; Professor Ernst Pöppel, world-renowned research authority on neurology, Germany; Professor Lawrence E. Sullivan, former Director, Center for the Study of World Religions, Harvard University, USA; Ven. Shih Liao-Yi, Dean of the Ling Jiou Mountain Buddhist Institute, Taiwan; Professor Ceilito Habito, Department of Economics, University of Manila, the Philippines; Professor Lou Yulie, Honorary Dean, Institute of Religion & Culture, Beijing University, China; Professor Ovid JL Tzeng, Chancellor of the University System of Taiwan, Taiwan; Mrs. Maria Habito, Director of International Programs, Museum of World Religions, Taiwan. 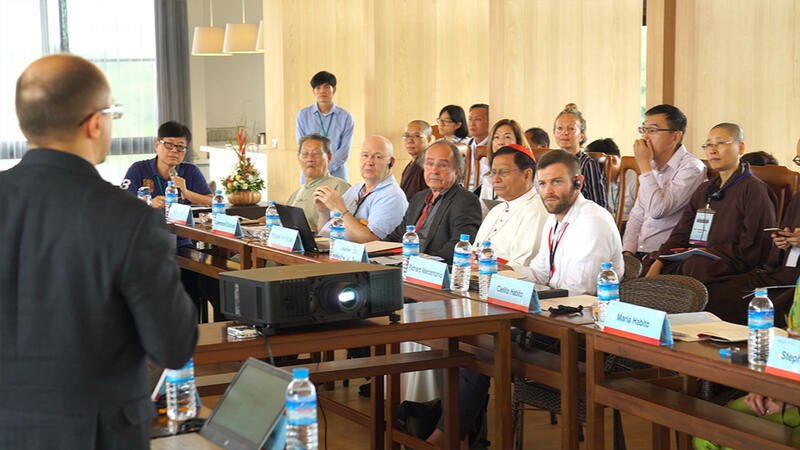 Other dignitaries that took part in the meeting included research experts Richard Marcantonio and Stephan Sneed; Catholic Cardinal to Myanmar Charles Maung Bo, S.D.B. ; and sir Phone Myat, retired general and former military commanding officer. “The objective of the 2nd think-tank meeting was to achieve a well thought-out design of the university’s syllabus and curriculum as a framework for education and learning in the quintessential subjects of “Life-&-Peace”, which takes its origin from the “Love the Earth” ideal and is attainable as such by virtue of a spiritual awakening,” noted Master Hsin Tao. Moving forward, it is desired that a spiritual education will ultimately provide the core for positive energies to develop from, first individually then collectively, to grow and embrace communities, businesses, politics, academics, and social movements across the board. And all of these shall evolve around the “Love the Earth” ideal and consensus. 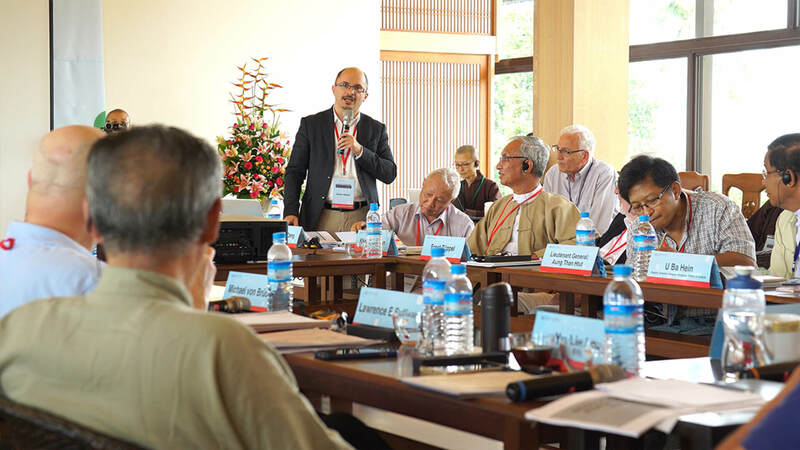 Expanded ideas from the Regensburg meeting paved the way for substantial discussions of the university’s future system of teaching and learning. 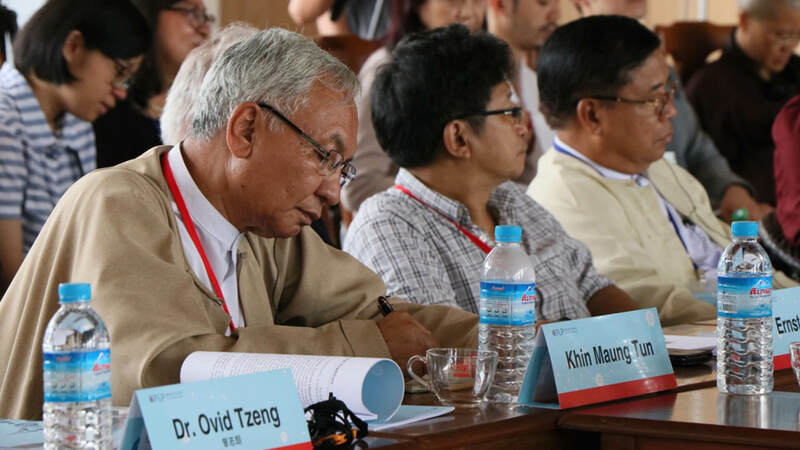 Expert participants contributed their respective specialties one after another throughout the 3-day meeting in Myanmar towards a common goal of an initial yet comprehensive structure of the university’s syllabus and curriculum. Master Hsin Tao led the delegation on a visit to the famed Shwedagon Pagoda in Yangon, when Day 2 drew close to an end. Many were in Myanmar for the very first time and marveled at the United Nation designated World Heritage for its blessed purity. The visit convinced everyone further that it is the best possible selection for the future University for Life and Peace to have its location in Myanmar. The delegation later also paid a visit to the Mahā Kusalā Yāma Monastery Elementary School at Lashio, where young novice monks are prepared and trained to become future torch bearers for the “Love the Earth” ideal. 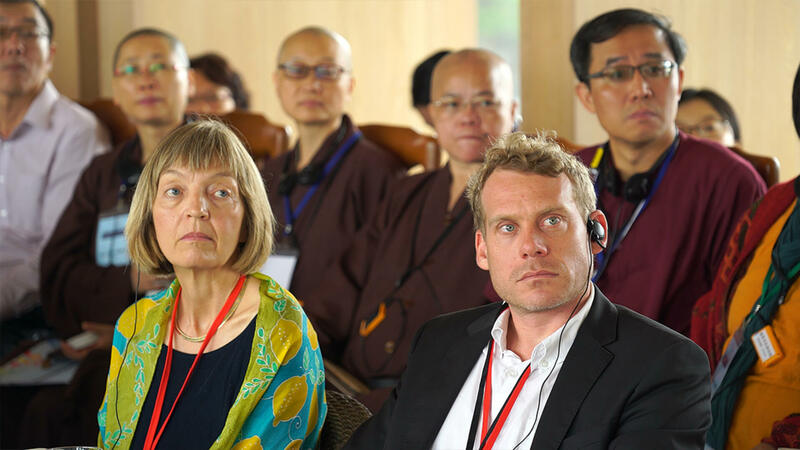 For the delegation it was an experience to witness how Master Hsin Tao in his on-going dedication sows seeds for peace, nurtured in a buddhist country that is Myanmar, and how these promise to flourish and embody future hopes for a world in peace and a buddhist legacy that lives on. Midnight and shortly thereafter. It ought to be quiet and no noise, as people are supposed to be sound asleep by now. 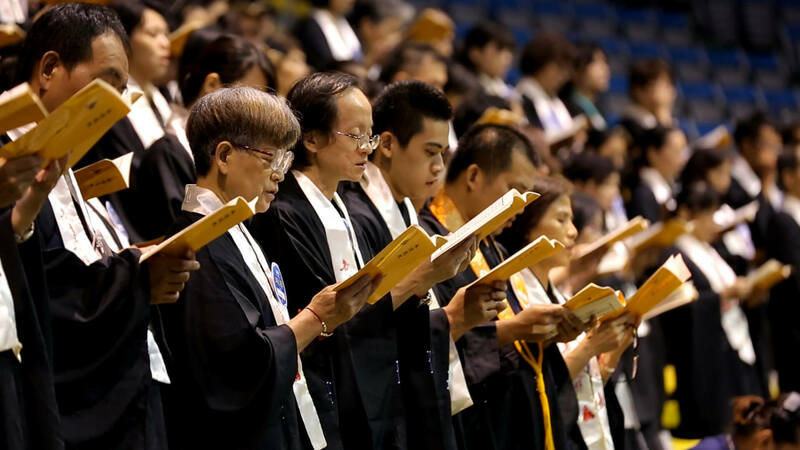 From the Taoyuan Arena, however, the sound of mantra chanting by firm devotees was clearly audible and it was peaceful yet far-reaching, sincere but steadfast. The sound came from Buddhist followers gathered there, and they were moving in slow, solemn steps in austere silence, approaching an inner altar and entering in an orderly fashion. Colorful fabrics symbolizing wishes and blessings hang high in mid-air like floating draperies, and flower pedals came swirling down from high above like drizzling confetti, only with a much more sophisticated touch. 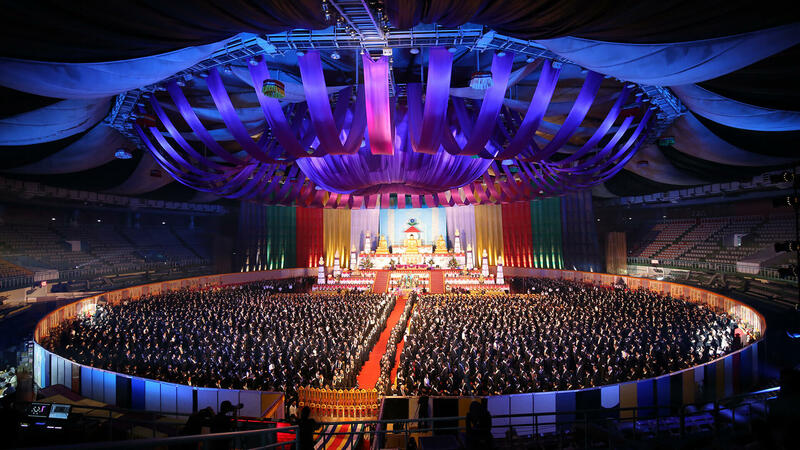 The space of the Arena was transformed into a Buddhist enchantment, and one could almost envisage sentient beings of the Three Realms all basked in the Dharma rain, awaiting their turns for the collective liberation. What a blissful Dharma joy that’d be to behold! The above-described scene would mark the first climax of the Waterland Dharma Ritual at the Inner Shrine performed annually by Ling Jiou Mountain (LJM) - enchantment as it is commonly known. For the purpose of a Waterland Dharma function, an enchantment designates a stand-alone space in time that is made exclusively accessible to sentient beings of the Three Realms to receive support and liberation. 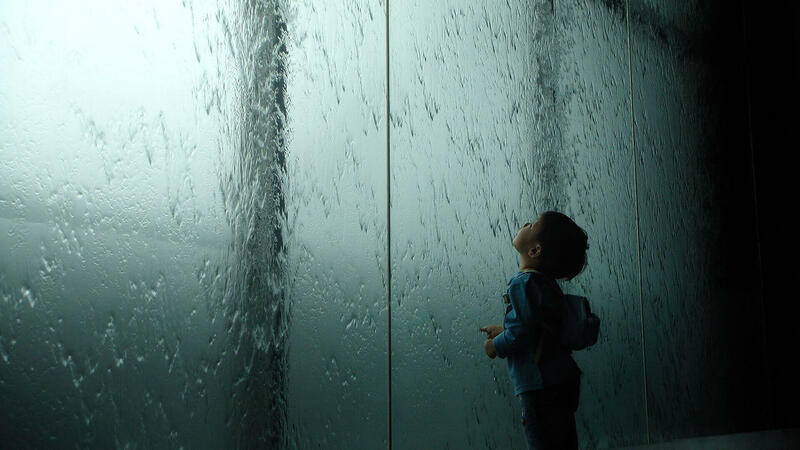 Have you ever, at some point in life, reflected on questions like where you came from , where you are going to? what life is all about? why you find yourself where you are? and caught in the emotion-ridden cycle of reincarnation? how does one escape life and death and finally manage to stay away from suffering and attain joy? From the shore of this life to the shore across beyond life, there are too many questions about life that demand response. To learn from the Buddha’s teachings is a gift and a sure way to find answers. In that context, the Waterland Dharma Ritual provides a blissful space designated for collective liberation, that liberates not only other sentient beings, but our own body, mind, and soul. The Waterland Dharma Ritual can be traced back to Emperor Wu of Liang of the Southern Dynasties, and substantiated during the Tang Dynasty with the help of early Chinese Tantric, then further matured over time towards a standardized Buddhist ritual throughout the following Sung, Yuan, and Ming dynasties, and crosses into our time nowadays. The full name of the Waterland Dharma Ritual is ‘Implementing an Enchantment for a Grand Collective Liberation with Great Vegan Offering and Dharma Commandments for Holy and Mortal Sentient Beings of Water and Land from all Ten Directions of the Dharma Realms’ and the name is thus self-explanatory. The Ritual pays homage to all Buddhas and saints from all Ten Directions and takes for its basis unobstructed provision of vegan food to symbolize an all-out support for all sentient beings from the Six Paths. As such, it belongs as the single most august and grand ceremony and ritual for repentance of Buddhism in China. The history of the Waterland Dharma Ritual stretches a long time of over one-and-a-half millennia and reaches back to the reign of Emperor Wu of Liang during the Southern Dynasties. Emperor Wu of Liang one day dreamed of a holy monk who offered the suggestion to ‘enact a Waterland Ritual with a large-scale provision of vegan food to support the spirits and t the sentient beings of the Six Paths and from all four forms of births, whose sufferings are immeasurable.’ The suggestion involved the royal engagement for a greater impact on more sentient beings, but Emperor Wu of Liang was still clueless with the part of the Waterland Dharma Ritual. The empire’s Supreme Preceptor, Chan Master Bao Jih, recommended to explore all available Buddhist scriptures for help to decipher the dream’s message. And finally, they came upon a story entitled ‘Ananda’s Encounter with the Face-burning King of Ghost’ that was directly relevant. It then took 3 years for a comprehensive manual for the Waterland Dharma Ritual to take up a more definite shape on the basis of the Alms-giving Dharma from the Immeasurable and Powerful Virtue of the Self-Being and Bright Dharani Sutra. The hard-earned manual for the Waterland Dharma Ritual, with royal patronage from Emperor Wu of Liang, however, went missing for more than 160 years after the dynasty was replaced. The manual was re-discovered later in the Tang Dynasty during the reign of Emperor Gao Zhong (649-683) after Chan Master Dao Ying of the Fa Hai Temple - coincidentally in a dream as well - promised to reenact a Waterland Dharma Ritual exactly as prescribed in the manual (known as lost but informed in the dream that a copy could be retrieved from another famous temple - the Da Jueh Temple). The dream eventually led to the re-discovery of the manual and the promise was fulfilled accordingly, and the Ritual could again be properly performed and literally ‘go by the book’ in full and down to the finest details. 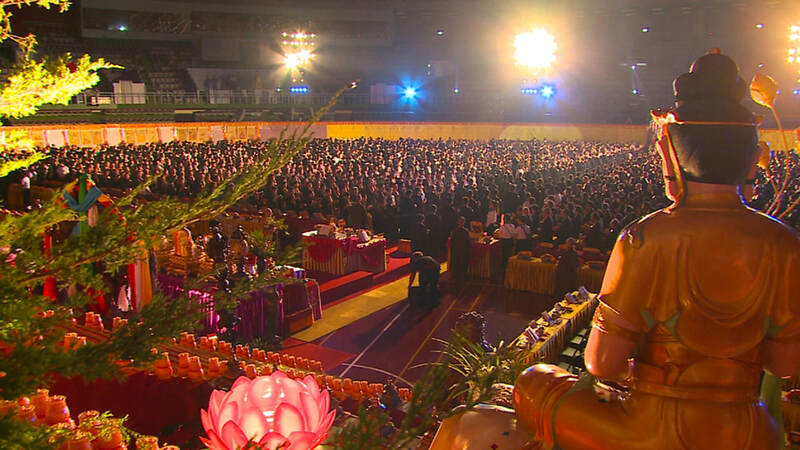 The Waterland Dharma Ritual once again became widespread in China and consequent development made certain that it remains the most important and spectacular Buddhist ritual. To conduct a Waterland Dharma Ritual would take a minimum of 7 days and nights for a satisfactory completion, and the purpose being for all involved in the participation to invoke Bodhicitta (the Bodhi-Heart) and the ensuing self-aware compassion in wishing for all sentient beings of the Ten Realms to free themselves from the reincarnation of life and death to take up permanent dwelling in the Pure Land of the West. Put differently, to participate in the Waterland Dharma Ritual is to stay close to the source of expertise and to learn about the teachings of the Buddha, as well as to meet in the aura of the Dharma. 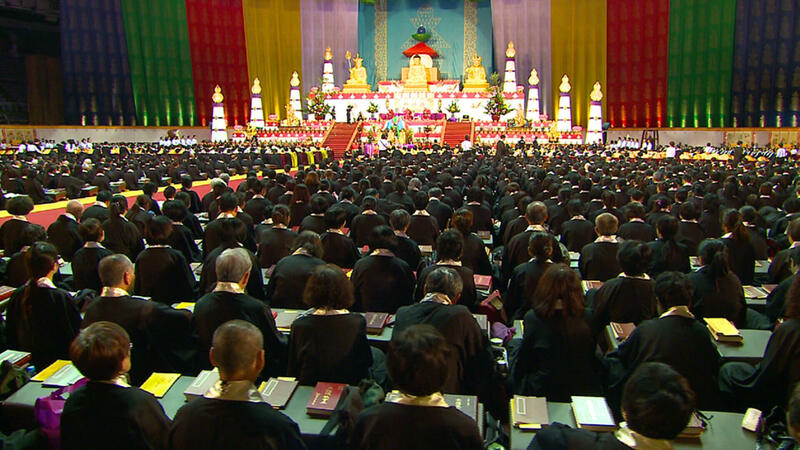 When the Ritual reaches the core portion of ‘Practising the Dharma’, the time finally arrives for Buddhas and Bodhisattvas to descend to the venue and coach those in the audience in their practice to become enlightened. Meanwhile, the sentient beings from the Ten Realms are also invited to join in the compassion and joy of letting go when finally attaining enlightenment with the liberation of the Ritual. Therefore, to participate in a Waterland Dharma Ritual is comparable to experience life as when the Buddha was teaching Dharma and preaching doctrines. A full implementation of a Waterland Dharma Ritual takes up a minimum of 7 days and can run up to as many as 49 days, and the scale of the event is quite extensive regardless of its duration. The scope of the offering of support and the liberation is enormous and extends to include all sentient beings from the past, the present, and the future; and from water, land, and air; and the same applies to the Ten Realms consisting of the Four Holy (Categories) and the Six Mortal (Paths). To make sure that the venue of the Ritual radiates an air of solemnity, its spatial arrangement and decoration are critical. 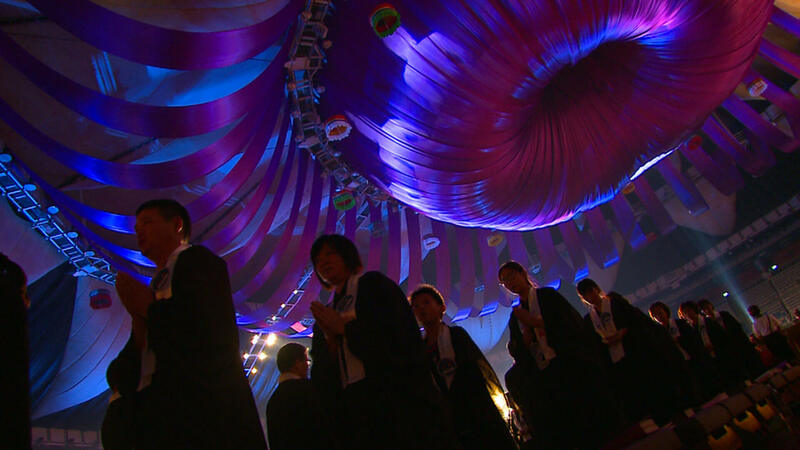 Generally, it divides into the area for the Inner Shrine and that for the Outer Shrine. The Ritual manual contains a summary of the essential parts of all major scriptures from the comprehensive Chinese Buddhist Canon and as such constitutes the single most important part of the Inner Shrine. It is thus esteemed as the ‘king of all repentance methods’ and its chanting benefits both the living and the deceased for sake of its immeasurable merit for liberation. The 12 key parts of the ritualistic procedure of the Inner Shrine are: secure an enchantment; dispatch envoys and hoist the banner; respectfully inviting into the upper court; present the offerings to the upper court; read out the proclamation for repentance; respectfully inviting into the lower court; read out the commandment for the netherworld; present the offerings to the lower court; complete the offerings properly; complete the incense-burning properly; burn the proclamation for redemption; complete bidding farewell to the sages properly. The Outer Shrine consists of eight smaller shrines that are respectively the Liang Emperor Shrine, the Avatam Shrine, the Lotus Shrine, the Pure Land Shrine, the Pharmacist Tathagata Shrine, the Surangama Shrine, the Multiple Classics Shrine, and the Arhat Shrine. Though in the form of a constellation with 8 individual shrines,each is in its own right a solemn Buddhist function equally significant and indispensable as any other for the overall Ritual proper. The Outer Shrine of the Waterland Dharma Ritual primarily serves the function for the recitation and chanting of major Mahayana Classics and the performance of rites for repentance. Its purpose is to seek redemption, relief from calamities, release from bad omen, help and support for the deceased in their liberation, etc. With its constellation of smaller shrines honoring different Buddhist scriptures, devotees of various practice in their respective tenure can opt for what to their knowledge and preference the best suitable shrine for participation. All the virtuous functions via the rites performed at the Outer Shrine have their own respective merits that devotees can earn and accumulate. When so desired to deepen the good karma and broaden its radius for blessing, one is advised to take part in additional praying activities and symbolic gestures such as offering vegan food to monastic monks, lighting up oil lamps, setting free of animals in captivity, offering food to ghosts and spirits suffering flames in their mouths, presenting flowers and fruits to the deities, etc. To implement a Waterland Dharma Ritual properly requires a minimum of 7 days and nights for a successful completion. 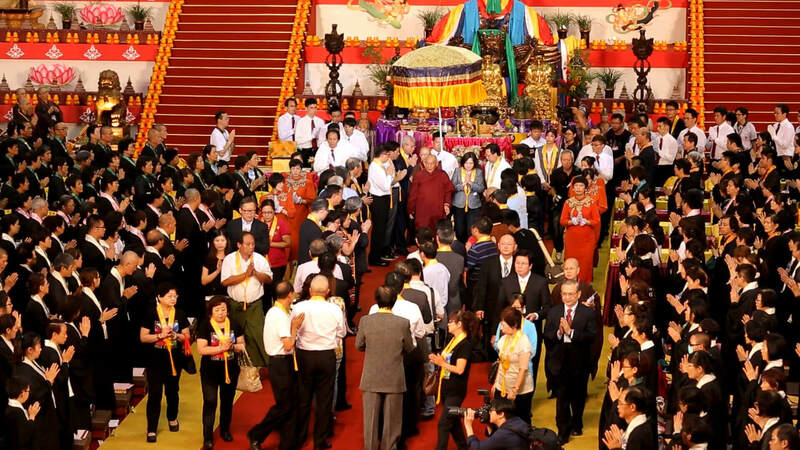 It also demands the engagement of more than a hundred Dharma masters to perform the rites. The amount of manpower and material resources involved is truly enormous, and it makes sense to believe that to participate in such a grandiose event is a rare blessing in itself. 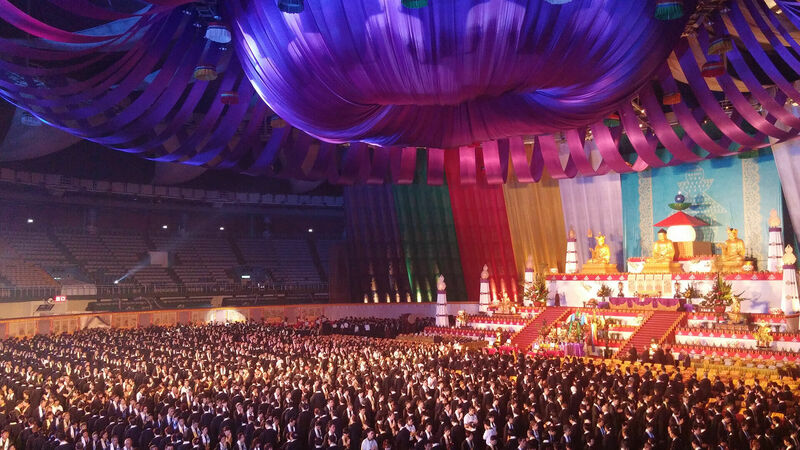 As a matter of fact, the participants themselves go through an exceedingly demanding process of cleansing that covers body, mind, and soul in preparations for the event beforehand, as well as throughout the event back-to-back. 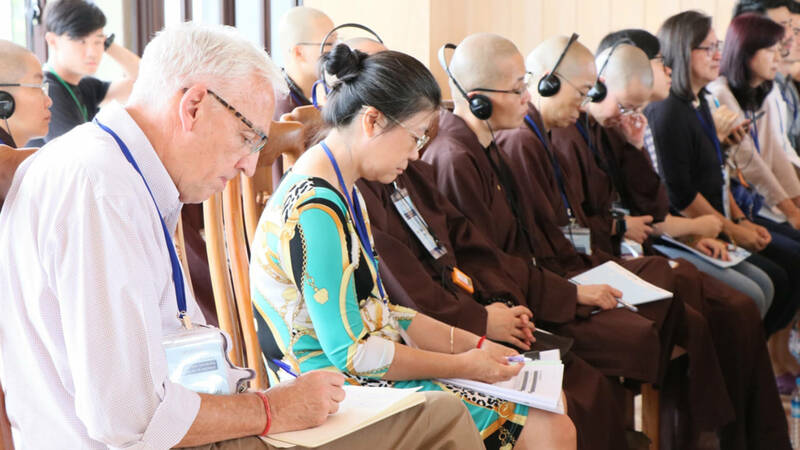 While reciting Sutras and paying homage to Buddhas to help contribute to the liberation of sentient beings, the participants in effect free themselves of worries and go search for life’s meaning and wisdom. That, after all, is the true meaning of ‘liberation’. Of all the Waterland Dharma Rituals conducted in the world of ethnic Chinese people, those performed by the Wu Sheng Monasteries of the Ling Jiou Mountain (LJM) have always been abiding by the time-honored rites as prescribed in the ancient manual. From date and time to standard and norm, from all sacrificial supplies to venue decors, from altars and shrines to their setting and arrangement, everything must go by the book and be exact down to the last details, while of an august and the most pristine quality. The entire function from soft- to hardware, from pre-event rehearsals to post-event wrap-up’s, is always executed with utmost care and prudence - literally in awe - just so that an impeccable ritual can be presented to illustrate the LJM expertise and professionalism alongside its respect for all in a broad sense of the word. Each year before the formal implementation of the Waterland Dharma Ritual, LJM would insist on the completion of 5 warm-up pre-functions. The purpose is to build up the momentum by having the participants go through much of the year in humility and in the mood of repentance. The effect of a year-long cleansing is evidenced by the merits rewarded individually, as well as reflected on the Ritual proper collectively to promise a perfect event that benefits both the living and the deceased. The warm-up pre-function is thus an LJM initiative that has become an integral part of its signature Waterland Dharma Ritual. Besides the 5 pre-functions leading up to the Ritual proper, both the participants and the working staff will be expected and required to stay focused and retain undivided attention. And everyone must go vegan for a whole week before the Ritual begins, which helps purify the physique to begin with. There is more, of course. Furthermore, Venerable Chan Master Hsin Tao would go into solitary meditation, and one month before the big event, LJM Dharma masters in residence would begin reciting Sutras that will be celebrated at the Ritual and that amount to 400-plus Sutras in total. Salaried staff and volunteers must recite the Ksitigarbha Bodhisattva Purva Pranidhana (one time), the Diamond Sutra (seven times), the Treasure Chest Seal Dharani (seven times), the King of Aspirations by Bodhisattva Samantabhadra (ten times), and the Bhaisajya-guru Purva Pranidhana (seven times). Patron participants would need to cite the holy name of the Buddha 3 thousand times or recite the Ksitigarbha Bodhisattva Purva Pranidhana once daily. Such would help purify the heart and the mind besides the physique. The collective merit of such devotion during the preparations illuminates and intensifies the power of the pledge to secure a perfect Ritual, and is reflected to benefit the sentient beings for them to leave sufferings and attain joy to achieve the supreme status of an Awakened. "Vow of Compassion / Rigor / Equality” sums up our mindset and attitude when we go about preparing for, and implementing, the Waterland Dharma Ritual the LJM way. For 24 years running by last year (2017) and always holding onto the spirit just described, the size of the participation in excess of 10 thousand devotees has been growing in proportion with the popularity of the Ritual. The number of attendance from overseas has likewise been on the rise. The Dharma is like water and can nourish all sentient beings of past, present, and future with peace and hope, as well as with the wisdom and valor necessary for life to forge ahead. The Waterland Dharma Ritual and its offerings of alms and Dharma, as well as of compassion and great vows, can help liberate all sentient beings. The Buddhist rituals that continue for 8 days and 7 nights is a collection of functions of calamities relief, massive liberation, presenting to higher realms, and bestowing on lower realms. We gain insight into the Buddhist views of life and death, sacrificial traditions, ritual procedures, ritual-specific folklore art, venue dressing and decor, etc. We also register advancement in appreciating the Buddhist spirituality by way of the Ritual - in that the power of the great vows of the living can help liberate sentient beings of other space and time from their sufferings. As such, the Ritual functions as the ideal catalyst to attain compassion for everyone who genuinely wishes to, and transforms everyone into a kind-hearted person, appreciative and grateful, and capable of leading a life of compassion, sympathy, joy, and relinquishment. Thus accordingly, we sign up to a Waterland Dharma Ritual and we bring our heart in gratitude, sincerity, and repentance. We join forces with fellow devotees and followers, so that our collective merits can be reflected to help all sentient beings for them to leave sufferings for happiness, and join us on the path of Boddhisattvas towards the way to the enlightenment. One simple action and it benefits both ourselves and many others, why then would anyone hesitate to opt in?